Okay, I have a confession to make. I am the most impatient person I know when it comes to life goals. Generally speaking I have a decent amount of patience. If you knew me personally, you wouldn’t think of me as a particularly impatient person. You could keep me waiting for an hour and would get away with very few sarcastic comments. But when it comes to producing measurable results around something I’m overly passionate about, I place a massive amount of pressure on myself to the point that I can get burned out very quickly. This past year hasn’t been easy and I wasn’t expecting it to be either. When I quit my job last year to transition to a career as a full-time writer and blogger, I knew that my path wasn’t going to be straightforward for two reasons- one, I was learning by doing and making a whole lot of mistakes along the way and two, I would have to accept that I would not be making half as much money as I did in my finance career. Of course there are far more important things than money but money is quite important as well and anyone who says otherwise is either lying or enlightened to a point that’s beyond my comprehension. But I wanted what I wanted- to wake up everyday and create something I loved and was proud of, and the freedom to travel as often and for as long as I pleased. So I rolled up my sleeves, enrolled myself in travel writing & social media courses, spent hours wrapping my head around the technical aspects of running a blog, put a conscious effort to better my writing, learnt new skills like photography, video, and marketing, and hustled like I’d never done in my life. And the results were encouraging- I got published in several online and some print magazines, my social media channels grew, my writing got better and I worked with a host of tourism boards, luxury hotels and tour companies. I even contributed a regular travel feature to a local print magazine in the UAE, where I’m based. In spite of all this, I began to feel dissatisfied. Sometimes I felt like I wasn’t growing fast enough. At others, I felt like I’d taken on too much. I compared myself to my peers and that can be a disastrous thing to do in blogging or writing. I spent less and less time with my family and friends and began to obsess about my work to the point that the thought of it no longer excited me. And that was also because I wasn’t writing the kind of stories I wanted to write-other contractual obligations and freelance work that paid better took precedence. Writers block. Burn out. A strong desire to travel to take time off everything. Over the past couple of weeks, I’ve realized that I need to slow down. My best friend has been telling me for a long time that maybe I’ve taken on too much. She’s almost always right and it’s only recently that I’ve started to accept that this time is no exception. I don’t want my personal relationships to suffer. I don’t want to feel disconnected with the people I truly care about. I don’t want to constantly think about how to grow my social media channels, where to pitch my writings, or how to get new clients, not every minute of the day or right before I fall asleep. And I definitely don’t want to skip my workouts and meals, because I’m too busy working on the blog or my writing. So, I’ve slowly begun to take it a little easier. I don’t beat myself up over some extra TV or music time. I take naps in the middle of the day when I really want to. I try to meet up with friends as often as I can and at least every other day. I’m still working hard, still learning every day and still hustling. But I’ve started to set aside time for my relationships and myself. I’m also slowly accepting that maybe my progress will be even slower this way, but at least I’ll still love what I do and why I do it. It was always about telling the best stories I could tell and inspiring others to believe that anything is possible if you want it bad enough. It was never about winning popularity contests or being famous. Heck, I hate the limelight. As I’m learning to slow down and accept that things don’t always go as fast or where you want them to, especially when it involves the creative process, I’m beginning to discover the joy of letting go. Que sera, sera- and it’s liberating. Sometimes it’s important to step back and look at your life from the outside to get some perspective. I thought I was marching down a path with conviction but eventually realized that the pace was going to burn me out and I wouldn’t get very far. So I’m slowing down- because I’m not in a race. I’ll let you know how it goes. Have you ever gone through a phase like that? Or learned something from letting go? Fellow bloggers and freelancers, how do you deal with work/life balance? I would love to hear about it in the comments – maybe your story could inspire me. I am currently experiencing exactly this blogging burnout you mentioned and I do think it is time to rearrange, step back and gain new perspective. Thanks for the piece! Thanks Liezel, I hope you get through it and come out with more clarity about why you like to blog and the direction you want it to take. I think it was one of the reasons why I almost quit blogging full-time. But it’s all about keeping the balance. This is not only an encouraging post, but a great reminder! Thanks for sharing with such authenticity and realizing that it is important to take time to refuel oneself, or (as a dear friend of mine likes to say), to get your “sparkle” back. It is about sharing stories to inspire others. Not the popularity. Not the limelight. Amen, sister! Good luck and keep blogging true! We’re in a similar position – always impatient and always on the go! But I’m learning to enjoy a slower speed, even during “speedy” short trips, and I’m taking more time just to people watch, eat, drink, and read. I totally get this! We travel way to fast sometimes and then have to be still somewhere for a fe months to recover! Nice work Natasha – everything you’ve said truly resonates with me, and I’ve come to the similar conclusion that I need to start to slow down too. It’s really difficult when you combine your work with a hobby to take time out for yourself, and difficult to not feel guilty about that extra TV time when this is a job where there is always something you can be doing to promote yourself more. But I’ve found getting caught up in that vicious circle really can have negative side-effects and you do find yourself burnt out. I completely relate to this, as I’m in the process of trying to let go of my day job to pursue my blog and traveling 100%, but it’s really not easy and can often be overwhelming and discouraging. Slowing down and remembering why you’re doing it in the first place is a good reminder. Admittedly, I’m a busy traveler and I like to cover as much as humanly possible. Since having a child and bringing her along often, I need to slow down. Things like naps and extra tv, like you mentioned, are part of our travel routine now. A healthy balance, I think, is key to enjoy the lifestyle. Very nice post and one we can all take read and use to reevaluate our own lives and how we need to slow down and enjoy the process and journey as much as the final outcome. Much luck to you in doing what you love and living a dream life, don’t sweat the writer’s block, it will come. I wish you much success and happiness. I get you. 🙂 I’m was super impatient but travel has taught me the art of slowing down. I can really relate to your words. I’ve written a post like this in the past – and even writing a post about it is a great place to start and being brave to put it all out there. Keep up the good work, don’t compare yourself to others, and stay positive! 🙂 🙂 You’ll get there! I’m trying to find that perfect balance too. To be honest I’m not sure I ever will because my business life and personal life are always evolving. Once I get into a good routine something always changes and I have to find a new routine that works better for us. But as long as I’m happy at the end of the day that’s all that matters! You’ve got your eye on the goal that matters- to be happy so that will help you focus on what needs to be done. We’re also trying to turn our blog into our full time job. I definitely struggle with the work life balance, but I love blogging so it doesn’t feel like work for me. My friends will always remind me that I’m working too much though. 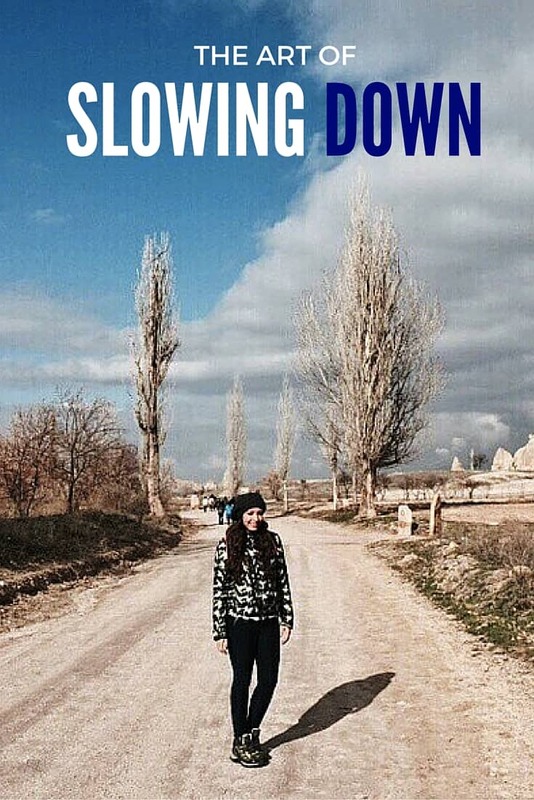 There is a lot to be said of slowing down, but I do think it is something that we often have to learn. We are guilty of frantic trips but I think the modern 9-5 way of living has you almost having to do that in order to pack so much in to a limited time. This is one reason we are quitting our jobs and travelling, so we can be free to concentrate on travel and do it at our own pace! The frantic bit can take a lot away from travel. I hope you’ll find it more fulfilling to travel at your own pace. Yes, Natasha, I started my blog 2 months ago and I can feel the constant pressure to participate in threads, always find new ways of promoting and since it is so young (the blog), the results have not been major, au contraire. I am also trying to slow down as we do not need the craze – we are already living enough hectic lives. Thanks for this post, it really gave me a food for the thought. Sound advice! I think you’re doing the right thing, as bloggers there is always the danger we live too much in the online world rather than the real one. I’ve experienced the same thing this year and as a result have gone part time at my day job to allow not only more time for blogging, but also for seeing real people, and going out and enjoying myself. Life, after all, is for living! Indeed is Heather, thanks for the comment! The key to enjoying anything is to slow down and savor the experience, isn’t it? Running, running, running just burns you out! I hear ya!! I did the sam thing (left my job for travel/blogging) so I am facing the same things. Hope you’re able to keep the balance Christine! Recognize a lot of what you write! And it sounds like a wise decision 🙂 I am very impatient myself too, with a touch of perfectionism. Problem is that ‘society’ (at least the professional working part) loves this – because it means you develop fast normally! Growing, growing growing. So we get a lot of thumbs up for that. Which makes it so hard to say: just slow down! Because as a human being, it’s so good to go with the waves! Go fast when you’re on one and wait more calmly, looking for the next one. My BF always says to me when I’m in panic for everything that’s not happened yet: It’s ok, all those things you want, just don’t want them all right now! I think it was one of the reasons why I almost quit blogging full-time. But it’s all about keeping the balance 🙂 Great article! I am trying to make it in the world of blogging/writing too. It seems like you managed to get a fair bit of success already, but just don’t lose sight of why you set out in the first place! I’m with you on this girl. Life can be quite stressful and sometimes, what we all need to do is just pause, slow down, and enjoy the moment. Rightly said Marge, thanks for the comment! True about slowing down. Whats the hurry, We spend too much of our precious lives in anxiety. We always find the end of the year is a great time to slow down. We always use it as a way to reflect on the current year and the goals we have for the next year. Good luck on your journey! Oh dear Natasha, I hope that you take a good care of yourself and please do give yourself a good time off and enjoy everything life have to offer 🙂 Slowing down is a good choice and it will for surely only give positive impact to you! Thanks Evan- I’m working on it. The reason I quit my career was because I wanted to spend more time with my son and I love every bit of it..later on I accidentally found myself into blogging…last month I celebrated the first anniversary of my blog…There are so many new things I learned and it wasn’t easy. But now I have started seeing the fruiys of all effort.. I have worked overnight and during my son’s nap times..It sure doesn’t pay as much as my civil engineering career.. but I feel very much happy following my passion and the fact that I get to spend every moment with my son.. Thanks for the comment Bilna and Happy 1st Blogversary to you! My husband slows me down…and that’s good.He makes me conscious of going overboard with blogging and social media. These next two weeks we are on “vacation” in Mexico! I can’t remember the last time I had a real vacation- enjoy! I have experienced similar situation in the last year when I made a career shift being a lawyer to a legal researcher where i also changed countries and had to learn how to my job all alone and face all what you have said before. It was painful but it was an essential period of a life to learn. What does not kill you, makes you stronger. You also learn how to enjoy spending time with yourself. Well said Imad and I hope the experience made you stronger. Loved this Natasha! And I could SO relate! I didn’t see myself taking a break to visit the U.S. any time soon, and now that I’ve hit the 2-year point, I’m ready to ease up on my projects, spend time with family again, and just take some time off for ME! Thanks Gloria! Good for you to make the decision to take time off for yourself and for the family. As travelers, we often say that travels are about the people we meet, yet, we often forget about those in our personal lives.